Have you ever met a dog who could ride the bus all by herself? Eclipse can, and her story went viral, catapulting her to national stardom. Now see the world through her eyes in this delightful photographic picture book! All I wanted to do was go to the dog park. I never thought my buddy Jeff would miss the bus. And I certainly never thought I’d become a pup with paparazzi! The story of this online sensation is so compelling you’ll want to share it—like the millions who already have on TV, online, and in newspapers around the world. Dorothy Hinshaw Patent has written more than a hundred books—mostly nonfiction and photo essays for children—including the ALA-ALSC Notable Children’s Books Dogs on Duty: Soldiers’ Best Friends on the Battlefield and Beyond. Dorothy is cofounder of iNK Think Tank, an online company dedicated to connecting educators and young readers with dynamic nonfiction books and their authors. Dorothy lives in Montana with her husband. For more information, check out Dorothy’s author page on Facebook and visit her website DogWriterDorothy.com. Jeffrey Young lives with Eclipse in Seattle. William Muñoz is a professional photographer and published photo-illustrator of more than eighty children’s books. He lives in Montana with his family. For more information, follow William Muñoz Photography on Facebook. This photo-filled picture book spotlights real-life Seattle dog Eclipse, who, in 2015, gained attention for riding the bus by herself. 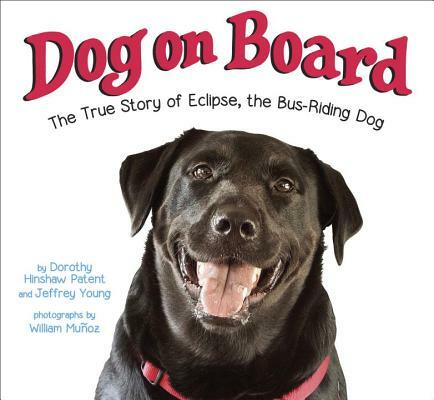 Told from Eclipse’s point of view, the story relates how she and her adult owner regularly took the bus to the dog park, but on one occasion, they became separated and she boarded alone. Fortunately, she remembered the right stop and got off, her owner followed, and they reunited. Soon, she began riding independently, eventually getting her own bus pass. Thanks to a local news story, Eclipse gains further friends and fame, and she describes other excursions, like visiting local businesses, and ponders future adventures. The lively text in a large, easy-to-read font pairs well with the many color photos depicting Eclipse on the bus and in the park, which highlight her friendly, social nature. Young, Eclipse’s owner, offers some further info about his four-legged friend, including the fact that she’s a service dog, in an appended note. Eclipse’s story is perfect for the picture book set, and doggie lovers will get right on board.